For the 24 hours to 23:00 GMT, the USD rose 0.09% against the CAD and closed at 1.3099 on Friday. In the economic news, Canada’s unemployment rate unexpectedly slid to a four-decade low rate of 5.8% in October, confounding market expectations for a steady reading. The unemployment rate had registered a reading of 5.9% in the previous month. In the Asian session, at GMT0400, the pair is trading at 1.3107, with the USD trading 0.06% higher against the CAD from Friday’s close. 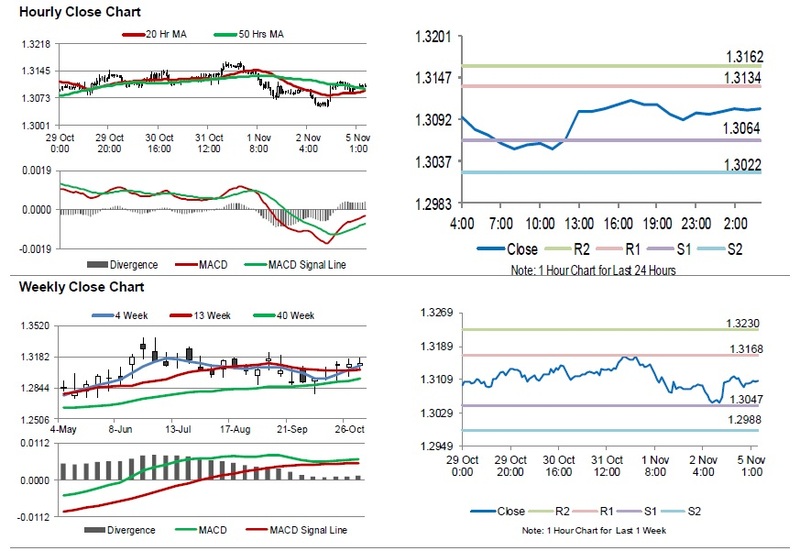 The pair is expected to find support at 1.3064, and a fall through could take it to the next support level of 1.3022. The pair is expected to find its first resistance at 1.3134, and a rise through could take it to the next resistance level of 1.3162.